Julian, 20-something, and Mark, 70-something, are on a journey to find the Mission’s best fried chicken sandwich. If you have suggestions, write a comment — or, if you prefer, send an e-mail to Julian at julian.mark@missionlocal.com. The Fried Chicken Desk received a tip from a prominent local gourmand insisting the fried chicken sandwich at Gas & Shop on South Van Ness and 17th was, far and away, the best in the district. Julian, an apprentice on the Fried Chicken Desk who invests richly in junk food, immediately volunteered for the assignment. Okay, let’s see. The dog and I walk by Gas & Shop on South Van Ness. There, pasted to the window, in black and white letters: Krunchy! Krispy! Who can resist? Behind the counter, a hot case, displaying golden pieces of what looks like chicken. Smells like chicken. The dog’s eyes go glassy. Must be the real thing. OK, chicken, but no chicken sandwich. I look at the dog. Then I remember Julian’s half-baked theory: “put a piece of fried chicken between two pieces of bread and you’ve got a fried chicken sandwich.” Eureka! 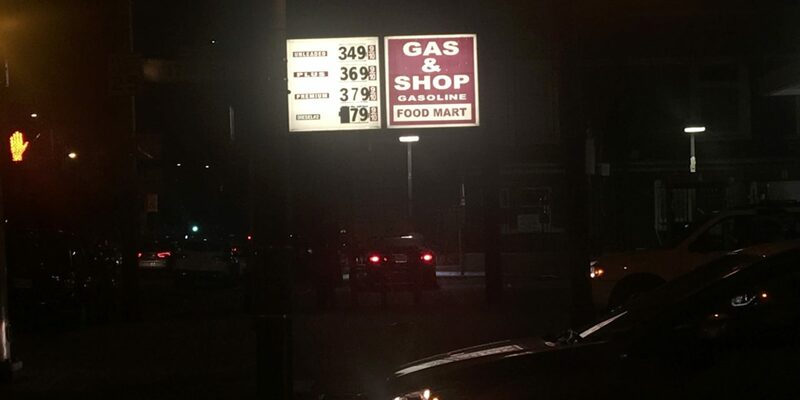 But Gas & Shop has no bread. No rolls. Oh, on the wall — a bun! A sweet bun! In a plastic bag. OK, hot-case chicken on a stale sweet bun from a gas station. What could be bad? Wow! Surprisingly good! I mean the chicken, not the bun, which was — never mind the bun. Check out the chicken. Moist, flavorful. And crisp. Not only crisp, Krispy! And Krunchy! White meat, dark meat, not just moist — juicy. Juicy? A few bites later, juicy tastes more like greasy. A few bites later, I can confirm we’re not talking chicken-fat grease. Something else. Something queasy. Here, at the website for Krispy Krunchy Chicken (“one of the fastest growing convenience store based quick service restaurant (QSR) concepts in the nation”), you can learn a lot. Warning! If symptoms of constipation and/or diarrhea persist beyond 48 hours, consult a medical professional. Mark: Sincere apologies for the delay. I was feeling fairly gung-ho about checking out the Gas & Shop until, upon entering the first time, I was reminded of my younger and crazier days behind the Redwood Curtain. These were wild times, man, venturing deep into the Trinity Mountains with more beer than food, and some manner of psychedelic in tow. Let’s just say, by the time we left days later, we were malnourished shells of ourselves. We were always in desperate need of food. Anything. Can you tell me what kind of food is available along Highway 3? Deep — I mean deep — in the cuts of Siskiyou County? And can you tell me where you might find this kind of food? It turns out that when you pull into a gas station with your health and sanity hanging on by a thread, the glistening — some would say radioactive glow — of piles of fried chicken sizzling in a case is pretty attractive. And it was usually no mirage: that stuff worked miracles. I’m sure (as your investigation suggested) the manufacturers of gas station fried chicken pump it with some pretty complex chemical compounds ingredients. But, Mark, that was a long time ago, and a long way away. And the associations are, well, triggering. So when I looked into the Gas & Shop for the first time and saw the hot case, I just kinda ran away. But my editor is now forcing me to review the Gas & Shop fried chicken sandwich after weeks of my silent resistance and, now, here I am. I also picked up a very tall can of Budweiser to go with the sandwich because, well, that’s how these things are done. The chicken’s breading justified its flavor designation: “Cajun recipe.” The cayenne spiciness was satisfying. But the sandwich had nothing else, save a few drops of BBQ sauce in between the halves of a white hamburger bun. And I was not at all surprised that the chicken was neither “crispy” or “crunchy” because the brand name is “Krispy Krunchy” — with K’s! Ersatz letters, per the unwritten rules of the English language, typically spell an ersatz product. And the Krispy Krunchy sandwich — or, rather, the chicken therein — did not seem … real. It looked, and tasted, a bit like recycled McDonald’s chicken nuggets. I also noticed a bit of yellowish discoloration at one tip of the chicken wedge, almost as if the patty contracted a bit of jaundice. But I ate it anyway and, well, it went quickly. So quickly, in fact, that I was only a few sips into my beer when I realized I needed another one. Given all of the amazing food in the Mission to be enjoyed on any particular day….